During the 19th century the printing industry became much more technologically advance, resulting in a major increase in the speed and output per printing press, and a consequent reduction in the cost of printing. Literacy had greatly improved through all sections of society, and the demand for cheap newspapers, journals and novels was unparalleled at any point in British history. 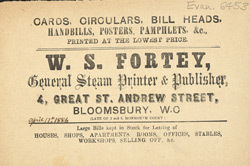 Printers such as WS Fortey would have been very busy producing posters, leaflets and trade cards, advertising not only their own business but all manner of merchandise, services and exhibitions for other organisations.